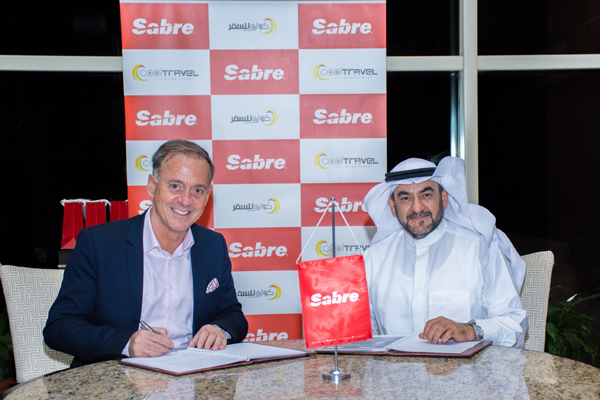 Sabre Corporation, a leading technology provider to the global travel and tourism industry, has reached a new agreement with Saudi Arabia's Cool Travel and Tourism to provide its industry-leading technology to support the travel agency’s expansion plans and online growth. Sabre and Cool Travel and Tourism have shared a commitment to innovation through travel technology for years, and the new three-year deal will represent an extended, broader relationship between the two companies. Cool Travel will be using the new Sabre Red Workspace, the technology provider’s next-generation travel agency desktop, benefiting from industry-leading content, data-driven insights and an intuitive interface. Under the agreement, Cool Travel will use the Sabre global distribution system (GDS) as one of its key platforms to shop, book and manage travel content from among 400 airlines, 900,000 hotel options and 40 car rental brands. Online travel is growing significantly in Saudi Arabia driven by high adoption for consumer technologies and high expectations from the travel players. Online travel bookings represent approximately 32 per cent of the overall Saudi travel market and this is projected to reach 40 per cent by 2021. “The Saudi market is rapidly evolving, driven by changing consumer and traveller expectations as well as availability and adoption of new technologies,” said Raymond Vrijenhoek, vice president, Sabre Travel Network, Middle East. “Sabre’s investments in mobile, data, merchandising and automation technology helps Cool Travel meet the needs of the tech-savvy traveller, delivering a more seamless, customised traveller experience.